A beach replenishment project on Ocean County’s northern barrier island will not begin until early 2015. Officials have confirmed to Shorebeat that bids for the project, which was supposed to begin this fall, will be solicited in the coming months with construction slated to begin after the new year. It is the second time the project has been delayed; the replenishment effort was originally scheduled to begin last spring. Stephen Rochette, spokesman for the U.S. Army Corps of Engineers Philadelphia district, said the contract will likely be advertised late this fall or early in the winter, with a contract being awarded in early 2015. “Construction typically follows a month or so after the contract award,” Rochette said. The $86 million project is primarily funded by the federal government and will be administered by the Army Corps of Engineers. It is separate from the ongoing steel wall revetment project which is currently underway in Brick Township and Mantoloking. The replenishment project will include the construction of engineered, vegetated dunes approximately 25 feet high with a 200 foot-long beach extending out from the dune line. The project will encompass the area between Manasquan Inlet and the South Seaside Park section of Berkeley Township along the barrier island. A breach in the island at Herbert Street in Mantoloking during Superstorm Sandy has been widely blamed for massive flooding that occurred on both sides of Barnegat Bay. 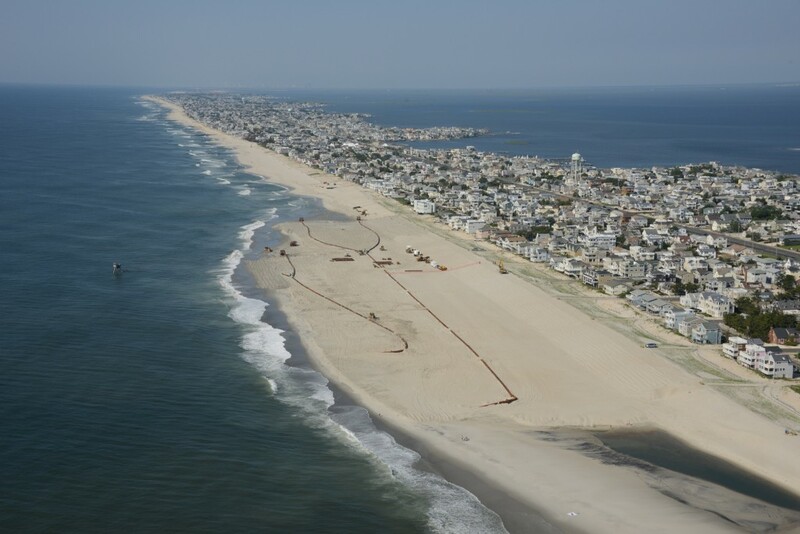 Officials have pointed to areas where nearly identical replenishment projects have taken place, such as Surf City and Harvey Cedars on Long Beach Island, as having better withstood Sandy’s wrath. The delay in the project comes as local residents remain worried that their communities’ battered beaches may not be able to withstand another large storm, such as a hurricane or nor’easter. In areas such as Brick Township’s Normandy Beach section and Toms River’s Ortley Beach section, the relatively small dunes that were in place before Sandy were completely destroyed during the storm. Both towns have built up temporary berms while the replenishment project’s planning has been underway. Doyle said the project has also been delayed by some oceanfront residents who have been holding out against signing easements required for the project. In most cases, municipalities have cooperated with the state in condemning the small slivers of oceanfront property needed for the protective dunes to be built, but in some areas – such as Bay Head – there has been opposition even from local government officials. Brick Township signed a cooperative agreement with the state earlier this year in which the Department of Environmental Protection would handle the relatively small number of condemnations required.